December 2016 – Where water meets land- connection. 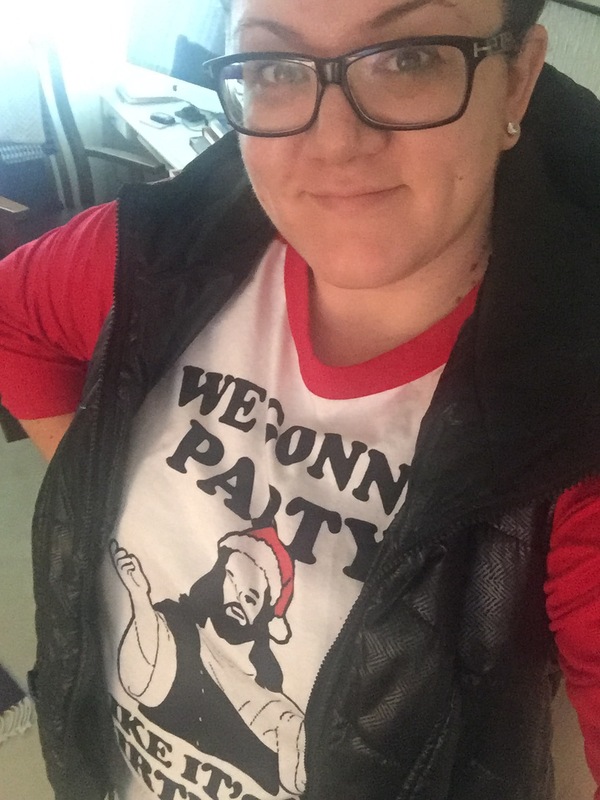 On Christmas morning, I put on my “we gonna party like it’s my birthday” shirt, complete with sketch of Jesus, grabbed a cup of coffee to-go, and headed to church with my mom. It isn’t often that Christmas falls on a Sunday morning, but this year, I was excited to have two opportunities to gather with the faith community that formed me. Church was casual, and set up in the fire-side room to accommodate the smaller crowd. Donuts and coffee were served and we were encouraged to come in our pajamas. While I edited the invitation to include my fun shirt and sweats- there were many who opted to wear full on pajamas. It was so fun! Traditionally, Christmas Eve has been my favorite service of the year- but this year- I have to confess that church on Christmas morning was just what I needed. Before we gathered in the fire side room, I stopped in the sanctuary to just take a minute and pray. 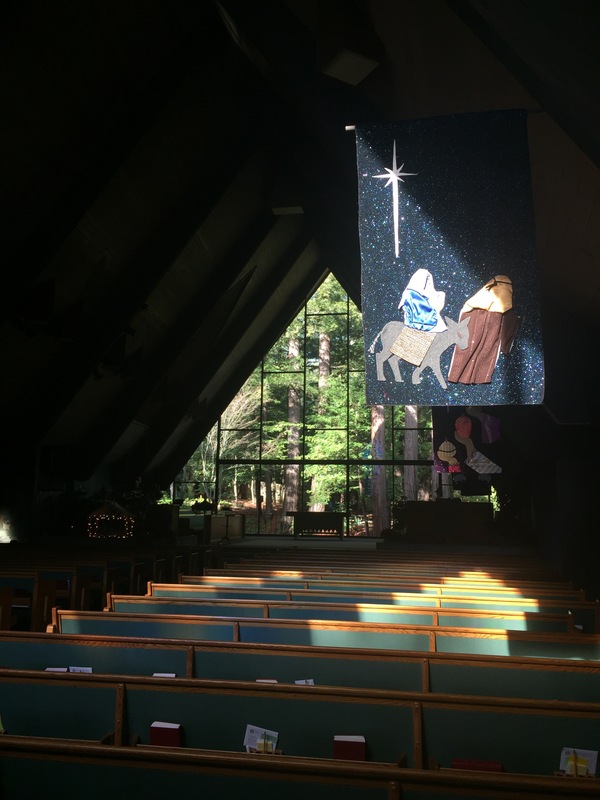 When I walked in, the light was gorgeous, and the space offered a holy moment in a way I hadn’t felt in a long time. After this moment, I headed into the fireside room that was the perfect amount of cozy and warm. With a fire crackling, we began worship. During worship we spent time singing, praying, and listening to different readings of John 1:1-14. Then, toward the end of worship, we prepared for communion. I had been asked to serve communion ahead of time, and looked forward to serving the many familiar friends that were gathered. Now, let’s circle back to the invitation to wear pajamas. As I stood up front serving the bread next to my mom who was serving the cup, I watched as a little boy made his way forward. He was about 3 years old and had come dressed in monkey footie pajamas, complete with a hat. So, he literally looked like a monkey. And he was absolutely precious. This was a moment that I will remember for a long time to come- a sweet, tender moment where a little one celebrated the meal and rejoiced. What a gift. And it hit me- this was a moment that wouldn’t happen in the formality of the Christmas Eve service. But this moment is what Christmas is all about- Welcoming a child, full of wonder, and walking away changed. This was my Christmas moment- and I am so grateful it happened. And ironically enough- it happened in an unexpected place, and at an unexpected time- and yet, the joy and love of Christmas met me in the sharing of bread and cup with a sweet little boy in monkey footie pajamas. What were your unexpected Christmas moments? Where did you experience a moment of joy? Mine was in serving communion to a monkey, may yours be unexpectedly delightful, just as the coming of Christ was. how I came to know God. For as long as I can remember, God has been at the center of my life. My earliest memories are the stories my parents told me about my adoption and how God saw me in my birth mom’s tummy, and knew she couldn’t care for me, and saw that my parents couldn’t conceive, so God made sure to put us together. God gave me dimples just like my mom’s so she would know i was hers when she saw me. From the very beginning of my story, there is the undercurrent of faith, of the belief in something bigger than myself- and even deeper and bigger than faith- there has been an undercurrent of love. My birth, adoption, the way i was conceived, none of that was ever presented to me in a way that was shameful- i was never made to feel less than. I mean sure, there were kids along the way that would make jabs about me being given up, but somewhere along the line, i understood that i had been chosen. I had been chosen by God, by my parents, and by this one, wonderous life. Have I had questions? Sure. Have I had moments of frustration in not knowing why I have curly hair, or why my body is predisposed to be the way it is? Do I sometimes wish I could look into the face of another and see my traits mirrored back, sure. But the reality for me is that from the very beginning, I have known how truly and deeply loved I am. The scary part is that I have spent the majority of my life testing the limits of that love. Not in ways that are always noticable- but like I have tried to find weak spots in an impermeable boundary. Ways that could make me say “ha! See, I’m not really worthy of being loved and chosen! I found a spot where the love doesn’t apply!” It is like trying to find a spot where an electric fence stops working…each time you think you have found a weak spot, you are reminded that the fence is still alive with electricity. Again and again, I am confronted by Love. Again and again, in my brokenness and my own inability to receive it, Love has pursued me, stayed with me, and up held me. Again, and again, and again. Growing up one of my favorite passages in the Bible talks about waiting on the Lord, and running and not growing weary. But, if you’re like me, running from Love, from God, has left me very weary, and exhausted. I have reached a point where it feels like I have reached the end of my running. I don’t want to test the boundaries anymore, I don’t want to search for a weak spot. I want to rest in the love that has been freely been offered to me. I have hit a point in life where everything I have worked for, everything I have been compelled to do out of duty, or obligation, or because I “should”…none of it makes sense anymore. Many things have fallen into place in ways that are better than I could have ever dreamed, but as I look at my life today, nothing of it is what I planned or imagined. As one who always strives to keep it together, it feels as though everything has fallen apart. I cannot tell you how liberating that is to type. And even more, what amazes me is that the peace I feel. I don’t know what is ahead, but I know it is going to be greater than what I had planned for my life. I am ready to pursue life with Love, living more authentically and abundantly. And I have clarity, amidst the chaos and mess. I have clarity that my call, my mission, my purpose, is to help others know that they are loved- deeply, without question- by God their Creator, and learn with them how to live in that Love instead of trying to out run it. We can’t outrun Love- we belong to Love, and Love is at the core of who we are. What I have come to understand is that Love has been promised to me because I am, just like each of you, a beloved child of God- fearfully and wonderfully made in Love. I am a Christian, a Presbyterian (PCUSA) to be specific. I was baptized Presbyterian and have been a practicing Christian for as long as I can remember. My parents are Presbyterian, and were faithful in raising me in the church. They were also faithful in making sure that I was aware of and accepting of other ways, beliefs, and people. They didn’t do it only in word, they matched it in action. On the day of my baptism- my parents asked two people to stand with them as they would all promise to raise me in the ways of faith. These people had been waiting at the airport when my parents brought me home to California at just 4 days old. These people have been present at every recital, performance, and life event- even if it meant getting on a plane or taking a road trip. My godparents have taught me an incredible amount about kindness, generosity, love, acceptance, invitation, compassion, integrity and faith. My godparents are Jewish. From a young age, I have been taught to say “happy holidays” because not all people are like me, not all people celebrate Christmas. So today, as I wished a store associate “Happy Holidays”, I was surprised to hear a woman ask me “why didn’t you just say Merry Christmas?” When I turned to see who had objected to my wishes, she proceeded to tell me how tired she was of people saying “Happy Holidays” when this is the season of Christmas. It is a season about Jesus, and the birth of our Savior. I smiled and introduced myself- and told her that I am a Presbyterian Pastor. Her face dropped and she began to apologize profusely as she checked out and we walked out of the store. I told her she did not owe me an apology. I just simply offered the reminder that not all people are Christian. We live in North Texas, a part of the country where there is a high concentration of Christians, but there are also Jews, Muslims, Athiests, Agnostics, Buddhist, Taoists, and countless other faiths represented, so assuming someone worships and believes the same things I do is an assumption that I would rather not make. As we walked, the woman said “but…with all due respect, shouldn’t you, of all people be wishing people Merry Christmas? I mean, you work for God!” I chuckled and smiled. I affirmed that I do work for God, and that I love Christmas. I told her of my excitement to decorate my house, about the fact that I have two trees, and about the nativity that holds a place of honor in my home. And then I told her about my Godparents- people who have shown me more about faith than most any other people in my life- and I told her that they are not Christian. I told her that my choice to wish people “Happy Holidays” has nothing to do with the weight or strength of my faith, but instead has everything to do with the fact that Jesus teaches us that we should be welcoming of all people. I told her I wish people “Happy Holidays” because the two of the people I love most in the world, people who celebrate Christmas Eve with my family every year, also invite us to celebrate Shabbat Dinner, Rosh Hashanah, and Hanukkah with them. She smiled, saying “well that makes sense”, and while she said she does not intend to wish others “Happy Holidays,” she at least understands and respects why I don’t say “Merry Christmas.” We parted ways and went on with our days. As I drove home, I kept thinking about our conversation, and I began to think about grace, and tolerance …and about Jesus. Jesus calls Christians to love God and to love one another. We cannot live into the commandment to fully love others as we have been loved until we acknowledge that not everyone is like us. I wish people “Happy Holidays” because my faith does not hinge on two words, or “keeping the Christ in Christmas”…I say it because I believe that Christ welcomes all, and though we may not worship, think, believe, pray or speak in the same ways, we are united and all deserving of acknowledgement. I also believe that in this climate, in the world that seeks to divide us into camps of “us” and “the other”- a little bit of tolerance and inclusion goes a long way. So…Happy Holidays- from this Jesus loving, Christmas celebrating Pastor, who would love to celebrate any holiday in your faith tradition with you. Advent has always been a special time of year for me. As a child, I always got excited to open the doors on the Advent calendar, prepare for the Christmas pageant, and light the candles in church each week. I love the music, the lights, the décor, and the general feeling of kindness in the air. As an adult, I have enjoyed preparing worship, writing prayers and sermons, and helping lead people in the journey to the manger. It has always been a time of preparation, of waiting, of anticipation- and at the risk of sounding nerdy, I love every second of it. But today, when I saw this picture, I realized that most of my experience and love of Advent were off base. I love preparing my heart and my spirit for the arrival of the Christ Child, and I am grateful for the new start that the first Sunday of Advent offers. But my experience and love of Advent have been tied to traditions, church, religion and culture- it has all been somewhat romanticized and seen through rose colored glasses. I have always yearned for the quiet and peace of the season- but this picture is a stark reminder that the conception, laboring and birth of Jesus were anything but peaceful and quiet. The story of Jesus and his family is the story of the family pictured here- A refugee family running from the horrors of war and genocide. A mother and father doing whatever they can to protect their baby and the hope that a child brings into the world. The story of the Holy family is brought to life in hard and painful ways in the image above. As a person of faith, I have struggled with the stories of what is happening in Aleppo- it breaks my heart, and I have failed to do as much as a should. But this picture, this picture brought to life the story and purpose of Advent in painful and Holy ways. The story of Advent isn’t about our own feelings and experiences- it is about opening us up to the promise that the Christ child offers for all people. It is the preparation of our hearts to welcome God Incarnate into the world in hopes that compassion, justice and love would prevail. The story is not a static historical account- it doesn’t stop at the manger. And it doesn’t stop at the US border. As a person of faith, I am convicted that the family in this picture is holy, precious, and carrying a divine promise. And we, as human kind, have a responsibility to make space for them, to help them find a place to rest. Mary and Joseph fled their home country in hopes that they could save their child. They were refugees who took shelter in a lowly barn, because there was no room at the Inn. We glorify this story, and celebrate it with our nativity scenes; but do we, will we, make space for this family who is in real and desperate need of a safe place? Will we send resources and aid to those who are desperately in need? Will we confront this discomforting image with the compassion, justice and peace that God entrusted us with? The story of the birth of Christ is one that brings comfort and joy- but I hope as you look at this picture, you will hear the story anew, and be moved from comfort to action. The reality of this family, and all that is happening in Aleppo, should make us uncomfortable. Really, really uncomfortable. Christ came so that all would have life and have it abundantly, and Christ came to unite us to one another. We belong to one another- this is the promise of Christmas. This is the power of Emmanuel, God with Us. May this family, and all the people of Aleppo, find shelter, safety and peace- and may we, who are safe, find ways to make room for them in our hearts, in our resources, and in whatever “Inn’s” we might have to offer. There are a lot of words that people could use to describe me- faithful, loyal, dependable, predictable, determined, hard-working….I’m sure those who know me have other words they would offer. But the word I have used most of my life to describe myself, my thoughts, my actions, my plans- the one word that has driven much of who I am and what I do is: “Should”. It isn’t sophisticated or high-brow- but damn if it isn’t spot on. Should is such a toxic word. It is an invitation to do any and all things, for any and all people/motivations beside yourself. What I have come to learn is that Should is the enemy to call and the adventure that is a faith-led life. When I look back on my life and examine the times I did what I thought I “should”, I wonder-what could have been different? I am one who believes that God leads you to where you need to be, and all experiences are kept within the bounds of God’s grace, so I have no regrets- but I wonder. What would have happened if I had chosen things for myself instead of what I thought others would want? What would have happened if I had been more open to relationships with people instead of closing myself off from the people I thought I should stay distant from? What would I do if I didn’t feel governed by responsibility and obligation? Some say it is a by-product of being an adult, but I take “shoulding” to an extreme. “Should” has been a place that first was driven by duty and obligation to others- but it is also a place where I have hidden, where I have chosen to not push myself, where I have chosen to do whatever I can to not disappoint others, where I have chosen not to listen to God’s call on my life, to not believe in my own worth, gifts and talents. “Should” has been a refuge for me to sit with my fears and worries instead of stepping out. So, in an effort to “stop shoulding all over myself”, I am looking at opportunities with open eyes; asking myself what I want to do, what life is calling me to do, and I am trying to do something brave everyday. It is a day to day thing, and there are moments where I feel like I am soaring, followed by moments where I am reminded that part of flying is falling. The ground can be hard. But again and again, I am trying. I am making time to be quiet, to indulge in time by myself- reading, praying, singing, feeling. The hope is that as “should” lessens its grip on my day to day life, life would become more of an experiential thing- not just something I get through. I am done being numb- and I am working on being done being afraid. Not because I “should”, but because I must. What are the things you would do if you stopped “shoulding” all over yourself? What is life calling you to? What is God calling you to? How often do we let “should” have the last word- keeping us isolated, lonely, separate? How often have we sought “should” only to turn up empty handed? “Should” is the word that tells us to stay in the car when we are invited to sit on the beach. It is the force that keeps us from coming to the shore to ask God what God has in store for this one, precious life…imagine what God WOULD do when we abandon “Should”? Life will be messy- but it will be beautiful, authentic and abundant. So as we look at today, and all the days to come- please, stop “shoulding” all over yourself. For about as long as I can remember, people have suggested that I write. When I was younger, people joked that the events of my life would make an interesting read. As I grew through my teenage years and into young adult-hood, people offered that I should journal to look back at my life and remember the day to day. As adult-hood made it’s way forward, the suggestions to write have turned into a call. People from random places and in all walks of my life have started asking “are you writing?” and “When will you write a book, you’re writing a book, aren’t you?” I have always tried to shrug it off, all the while feeling the tug to respond to the call. But, what would I write about? I’m just a woman, living my life in the day to day, trying to do the best I can for the most I can. I am not extraordinary. Regardless of the qualifications I do or don’t think I have, the call to write has kept pressing on my heart and my mind. On a recent trip I took to New Orleans- I stood in Jackson Square buying a piece of art for my now partner. As we were wrapping up, a woman approached us and started talking to us about nothing in particular. She was drawn in by the art we had purchased, and felt led to chat with us. In the course of the conversation, she stopped me mid-sentence and said “you’re writing aren’t you? because if you’re not, you should be.” Less than 5 minutes in, and there was God, showing up in the words of a woman from New York- urging me to write the story of my life and my experiences with God. And yet, I shrugged it off. Y’all, a message doesn’t get much clearer than that. When a complete stranger speaks the call you have been hearing and feeling for much of your life, you would think I would turn and run to the nearest spot to sit and write. But…I’m stubborn, and I am not a risk taker- and, has been the pattern of my life, God often speaks, I am slow to listen and even slower to act. As a planner, and a list maker, the idea of writing tasks and topics is familiar. I am good at writing “to-do” lists, grocery lists, and little notes. Writing words that I will speak comes easy to me. But when confronted with the idea of writing with nothing specific at hand, and no time limit to work within- it all feels overwhelmingly abstract. It feels uncomfortably vast. Writing like this feels so open ended, so limitless. And while that is exciting, it is also terrifying. But as the last few months have gone by, the call to write has become stronger and stronger. Over the last few months, my life has been in an evolution of sorts- or a revolution. But no matter the circumstances, one things has continued to come to the surface- write. So here I am, offering words. If for no other reason than I have to. I can’t avoid it, or shrug it off, anymore- it is time to write. On the night of the last full moon of the year, I thought it as good a time as any to set my intention and start putting words to paper (or screen). Here is to the adventures and stories ahead- I hope that here you find solidarity, hope, encouragement and reminders that you are loved. I hope this becomes a point of connection. Most of all, I hope that in the words offered we will find our way to the shoreline of what it is you and I feel called to- standing on the edge of what we know, confronted with the vastness of what is yet to be discovered.